Two dead dolphins have been delivered to government offices in the heart of London in a bid to highlight the threat to the creatures from fishing trawlers. 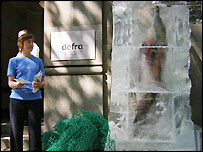 Greenpeace staged the stunt to coincide with a legal challenge they hope will prompt a ban on pair trawling. The practice involves two boats dragging a net that can be the size of several football pitches. A Greenpeace spokesman said: "The government can no longer bury its head in its hands and neglect this problem." She told BBC News Online that both the dolphins, which were encased in ice, showed signs they had been caught in nets such as torn flippers and broken beaks. "For far too long, the government has continued to allow destructive fishing practices to push dolphins around the UK towards extinction," she said. "By allowing this killing to continue, the government is failing in its legal obligation to protect dolphins, and that is why Greenpeace is today mounting a legal challenge. "These dolphins on their doorstep represent only the tip of the iceberg - thousands of dolphins die each year around the UK." Fisheries Minister Ben Bradshaw said: "I have said on numerous occasions that the level of dolphin deaths is unacceptable and action must be taken." He said progress was made on 23 March when a new agreement was hammered out in Brussels. The Greenpeace spokesman said the dead dolphins had been pulled out of the English Channel off the south-west coast by a Greenpeace boat. 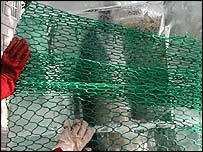 They were delivered to the Department for the Environment, Fisheries and Rural Affairs in Westminster, central London. Greenpeace said that according to the EU habitats directives, the government is "obliged" to ensure the accidental capture and killing of certain species, including dolphins, "does not have a significant negative impact on the species concerned". "The government already has irrefutable evidence that the UK sea bass pair trawling fleet kill dolphins," claimed the spokesman.